Cotacachi’s spa life is amazing … for one reason … La Mirage. 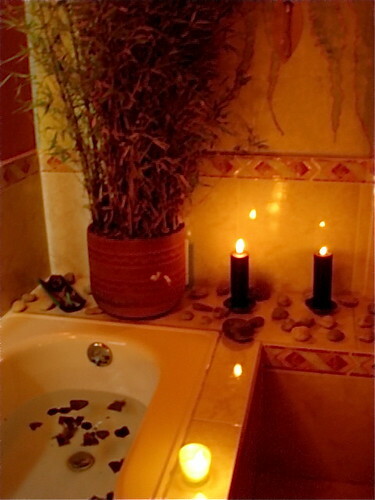 See how this Coacachi spa shamana can help you in the photos below. Plus see how I became a guinea pig as the Amazon came to this Cotacachi spa. Who would think that a small, remote Andean village like Cotacachi would have a Relais and Chateaux spa? Imbabura Province. It is more than a little responsible for our being here now. 13 years ago I wrote this about my first trip to Ecuador. “Quito is where our adventure began as we were ‘turistas’ who rode north far into the Andes . We headed north for the world famous Indian markets of Otavalo and the leather village of Cotacachi just beyond. “The road we traveled was the Pan American Highway. Grey mists rose and obscured a green valley below. Snow capped mountains lurked in the distance. Tiny villages were nestled along sharp ridgelines on the horizon. The scenery had an austere beauty at this altitude. “At lunch, we discovered La Mirage Garden Spa. We had been given the name of another hacienda to check out for lunch but our driver ignored our instructions and took us to La Mirage. Perhaps this was because he knew that La Mirage was better. So for 13 years we have had a love affair with Cotacachi’s magical Relais & Chateaux rated garden hotel, restaurant and spa. 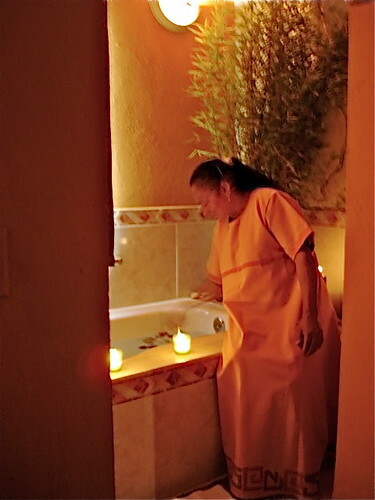 We try to send all out guests to use the La Mirage Cotacachi spa. Over all these years Merri and I have become friends with the owners … and this as led so … to my becoming the Cotacachi spa guinea pig. One of the owners at the hotel … Jorge Espinosa is a very accomplished and talented architect. He is as surprising as the spa is amazing. Every time one thinks that nothing more could possibly be done to make the spa better, Jorge comes up with some new Cotacachi spa delight. What is more he builds a room just for the new treatment! Jorge has learned how to make the spa increasingly wonderful. He also knows that my tastes are similar to the many guests we send. Who could be better than to try out each new spa treatment first? After all, someone has to do the job. Thus I was able to report to you when this Cotacachi spa created a chocolate massage. I was right there checking things out for you when the spa added the wine massage as well. Now I am happy to report the introduction of the Amazon massage. What a chamber it is … you step from the tub directly into a cave – hidden – deep – in – the – rain – forest atmosphere. 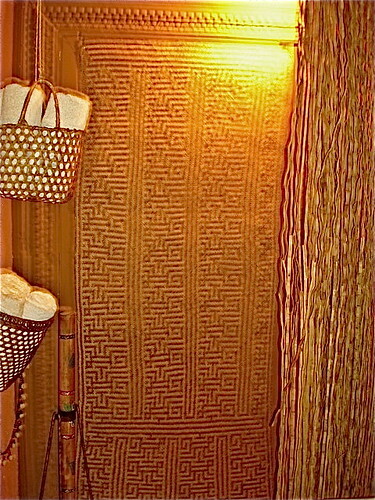 The room, from the huge Amazonian carpet hung in a wondrous frame to the drooping vines and bamboo has a vague moodiness. You really do feel Amazonized … forest lost … surrounded in gold tinted warmth … camp fired in a deep mysterious woods. 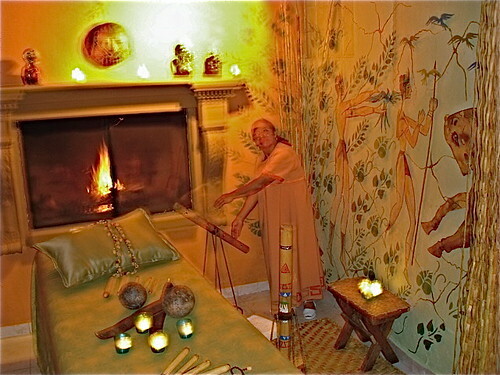 Last week I visited this room and had the massage. Until next message, may all your massages be bambooed and oiled. Join us in Cotacachi and visit the Cotacachi La Mirage Spa.